Extended period of light inhibits the secretion of melatonin which promotes fertility through an increase in the levels of reproductive hormones. You have probably heard many people claim that using electronic devices like e-readers at night is not very good for your sleep health. But unlike many of the claims out there, science is able to validate it. Melatonin is a hormone that promotes sleep; the circadian system controls its production. During the day, our melatonin levels decrease to keep us active and awake, while close to sleep time, melatonin naturally increases to promote sleep and rest. High frequency rays from the visible light spectrum, such as the blue light emitted from our electronics, inhibits the production of melatonin, causing restless sleep. However, this might have important applications for the equine breeding industry. This idea has been applied to improve breeding techniques of race horses. For centuries, breeders have exposed female horses (mares) to extended periods of light during the winter months to improve fertility. Naturally, mares seasonally reproduce, with their peak fertility occurring during the summer months. This is because, the extended period of light inhibits the secretion of melatonin which promotes fertility through an increase in the levels of reproductive hormones. However, to the racing industry, it is important to hasten the onset of the next reproductive cycle to the winter months which allows them to produce foals earlier in the year. It is also important that the horses have optimal coat conditions year round to be eligible for competitions. This calls for artificial interventions such as the light therapy previously mentioned. However, with this technique comes several considerations. For one, the mares which are usually kept outside are moved into the barns to artificially extend their light period to 16 hours. This has benefits for their fertility, but it removes them from their natural environment which can be very stressful for the animals. Also, horses are grazers, so moving them inside decreases their pasture time, which has consequences for their overall health. 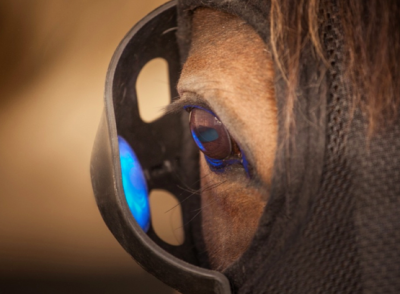 With all of this in mind, a research group in Dublin, led by Dr. Barbara Murphy, developed a mobile version of the barn lights which will allow the horses to receive their artificial light while remaining in their natural environment: the Equilume mask. Before the creation of this mask, the Murphy research team investigated the minimum intensity of light that will inhibit the melatonin release system to ensure that the light was not harmful to the animals. 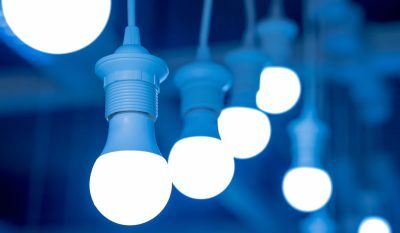 They found that low intensity light was even more efficient at both activating the reproductive system, and decreasing the length of pregnancy in mares than high intensity light. Thus, they decided on using blue light. So, after many investigations, the Equilume mask was created to feature an automatic light that comes on at the first onset of dark and shuts off at dawn. It shines a constant intensity of light into one eye, leaving the other eye free to be used for sight. This promises to keep broodmares mobile during the winter months, increase pasture time, and as a result create the optimal conditions for pregnancy. These practices of breeding, both old and new, feature a crucial element: the circadian system. It has become increasingly obvious that the experimenting with this system has many consequences for both human and veterinary fields as well as their applicable industries.